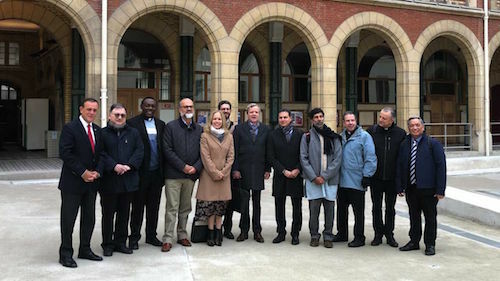 It was at the initiative of the Università Cattolica Del Sacro Cuore (Milan, Italy) and of the Katholieke Universiteit Nijmegen (Nijmegen, Netherlands) that preliminary steps were taken in 1924 to bring together the Catholic universities in a Federation to discuss specific issues of common concern. These endeavours were concretised the following year during a meeting at the Institut Catholique de Paris where 14 universities from the various parts of the world were represented at a first General Assembly. It was only after the Second World War that the Fœderatio Universitatum Catholicarum took off. It was recognised by a Decree of the Holy See in 1948 and by Pope Pius XII in 1949. It became the International Federation of Catholic Universities (IFCU) in 1965. IFCU collaborates actively with the Congregation for Catholic Education. To contribute to the development of Catholic higher education and to the assertion of its specific identity. Research – Foresight Studies – Projects –Training. In addition to these, there is international representation in various bodies such as UNESCO, ECOSOC, the Council of Europe, among others, where IFCU has the voice of Catholic universities. At present, the Federation is made up of more than 226 Catholic universities and higher education institutions. This diversity is most positive. It is fundamental and remains indispensable. At IFCU, we seek to defend it in the very spirit of what we are: a federation. Each member must feel at home with others. A common house, composed of all the materials of the world, this is what IFCU is. Of all the materials of the world: with us, there are also non-Christians, and even non-believers who are involved in common research projects, partnerships and exchanges. In the concert of voices that cry out for knowledge and justice, for a universal science and conscience, the International Federation of Catholic Universities holds its own with a tone that is specific to it. It is this concert of voices we would like to make you discover or re-discover. Any Catholic university or university level institution that is legally constituted and shows an institutional commitment in the service of Christian thought and education can become a member or an associate member of the International Federation of Catholic Universities. The Federation has a permanent secretariat that is responsible for implementing the orientations and policies defined by the General Assembly and the governing bodies. In addition to the administrative and management tasks of IFCU, the Secretariat also carries out events, coordination and information tasks for all its adherents and partner organisations and institutions. The Secretariat has a permanent staff of various nationalities for its different activities: administrative secretariat, promotion and coordination of inter-university research, information and communication, and financial management. It is by taking into account the changes of higher education and wishing to better prepare our Catholic universities that the Training Department was created. These training sessions are structured around topics such as "Management and Leadership", "Internationalization and Interculturality", "Pedagogical Innovation", "Academic Conflict and Mediation", "University Pastoral Care", and "Improving Research Policies". The training offer is set to evolve in order to take into account the reality of an ever-changing university world and to propose programs that will enable university and Catholic world staff to meet the major challenges of today. tomorrow. For the 2017-2018 period, no less than a dozen face-to-face training courses were delivered in English, Spanish and French, benefiting some one hundred people. For more information, you can visit the page dedicated to the Training Department. Since 2018, IFCU has a funding tool for academic and social cooperation projects. The Laudato Si’ Endowment Fund aims to support a policy of developing research programs in the humanities and social sciences in Catholic higher education institutions worldwide. This electronic journal lists the main news and articles on the main themes of higher education in general and on Catholic higher education and IFCU in particular. This E-magazine is the fruit of an advanced collaboration in the field of artificial intelligence between our Federation and "Globe-Expert", a particularly innovative Startup in this field. The global market for higher education is today challenged by profound changes; those linked to the 4th industrial revolution, organized around the NICT revolution and now Artificial Intelligence, are among the most important. In the short term, the organization of our campuses will be deeply modified; While the world of employment will be transformed by the emergence of new jobs, the disappearance and the mutation of current jobs, our universities must also prepare themselves to launch new trainings. In order to help Rectors and Management Teams of its member universities, IFCU has created a Higher Education Foresight Unit. Its activities are as follows: publication of an annual report on the "Future of jobs", publication of an annual report on Catholic Higher Education; animation of debates and seminars around the changes of professions and therefore new training to create for students. The presence of IFCU in the International Institutions dates from 1965, this international Catholic voice in the field of knowledge is heard in Paris at UNESCO with an observer status, obtained in 1967; in New York at the UN Economic and Social Council (ECOSOC); in Geneva, at the UN Human Rights Council; in Strasbourg, at the Council of Europe. The Federation is also present in the OECD Higher Education Stakeholder Forum and the OSCE Network of Think Tanks and Academic Institutions. In all these instances, the voice of Catholic academics, via the network of experts of the Federation finds an echo. In the course of 2019, FIUC will launch a single portal for all Catholic universitie, with practical features reserved for the affiliates of the Federation. This cooperation tool aims to provide the most comprehensive overview possible of Catholic Higher Education and to foster collaboration between affiliated universities via a collaborative platform, calls for collaboration, calls for projects, etc.